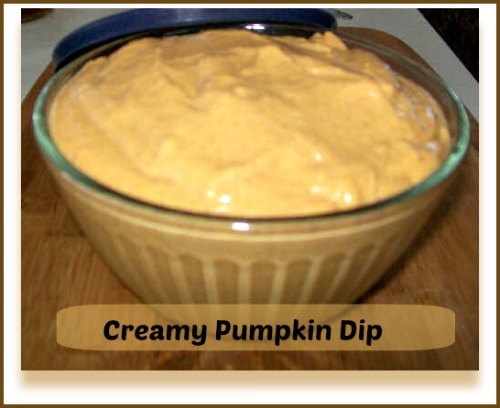 This recipe for creamy pumpkin dip is easy to make and so delicious. I am always looking for easy appetizers to serve at parties. This one is a favorite of my guests. Do your party guest like creamy dips? So do mind. And since pumpkins are such a big part of fall, this dip incorporates pumpkin puree in a tasty and sweet way. A generous dash of bourbon also adds some great flavor. Start your party with some creamy pumpkin dip. We are right in the middle of the party season that lasts for three months each year. This dip is perfect for both Thanksgiving and Halloween and has a creamy cheesecake like texture. The recipe was submitted by a fan of The Gardening Cook page on Facebook, Diamond Victoria. Thanks for submitting it Diamond! I loved creamy dips. They are perfect for both fruits and pretzel chips to have as dipping options. They are always popular with my party guests. This dip combines canned pumpkin with cream cheese and confectioner’s sugar for a sweet dip that Diamond says tastes great with ginger snaps or slices of apple. And did I mention there is bourbon in the dip too? Perfect for a party! She also changes things up a bit by adding a can of whole cranberries to this and using it on turkey sandwiches! This creamy party dip is flavored with pumpkin and bourbon. Your guests will love it. Sift the confectioners’ sugar with the instant milk & pumpkin spice. In a bowl whip the cream cheese till it is soft and fluffy. Add the bourbon and beat for about 30 seconds. Add the pumpkin to the cream cheese and beat till it is thoroughly mixed. Carefully add the pumpkin mixtures to the confectioners’ sugar mixture and on a low speed on your mixer, mix till it is all mixed. Refrigerate this for at least 24 hours.